It’s finally HEEEERRRREE!! Well sort of! Kind of! Almost! Around this time last year my family of 8 (5 humans, 3 quadrupeds at the time) was living in a hotel. The roof of our home had been damaged in a storm, and we ended up having to empty a couple of rooms and leave for weeks while repairs were made. We put up a small 4ft tree, a few decorations and made the most of it. While I always tend to make the most of our circumstances, I do think that it put a little hitch in my get-along. I haven’t really done much decorating for anything since then. I even forgot to put up my brand new Halloween décor this year *eyeroll*. But Christmas is SO FUN to decorate and design for! So being in our home again this year, I started putting out my winter décor November 1st, and I have been designing since August. 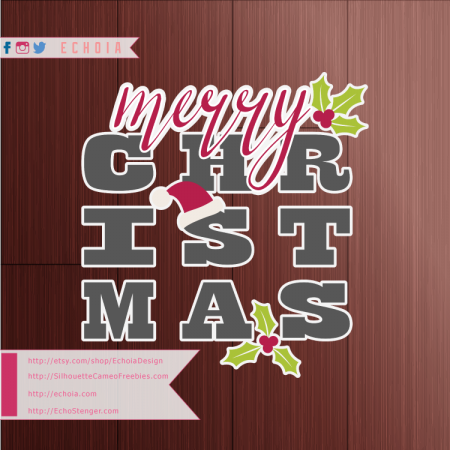 And since one of my favorite parts of this season is the giving, I have yet another new cut file for my fellow Freebies! I hope you guys like it. ‘merry’ is in my own hand writing, which I’m always so excited to be able to incorporate, and I am truly pleased with this design and its versatility. If you are in need of a commercial license, this design is available for purchase at EchoiaDesign on Etsy.